Renault was the top-selling electric carmaker in Germany in 2017 with the Zoe the favorite electric car model of the Germans. Volkswagen and the electric VW Golf are catching up fast. The Renault Zoe was the most-popular electric car model in Germany in 2017 with Renault the leading electric car brand with a 17% share of the market. For once, Volkswagen was relegated to second place in Germany with the electric Golf only the second most-popular car. Smart and the Fortwo were the third best-selling electric carmaker and model in Germany in 2017. Although electric car sales doubled in Germany in 2017 the actual numbers remain woefully low. Electric car sales in Germany in 2017 increased by 120% to 25,056 cars. New passenger vehicle registrations in Germany increased in 2017 by 2.7% to 3,441,262 cars. Electric cars thus had a market share of only 0.7% in Germany. It also remains to be seen how many of the electric cars remained in Germany in 2017 – in previous years many electric cars were sold on to other countries, especially Norway, as second-hand vehicles. Renault sold more electric cars in Germany in 2017 than any other car manufacturer. 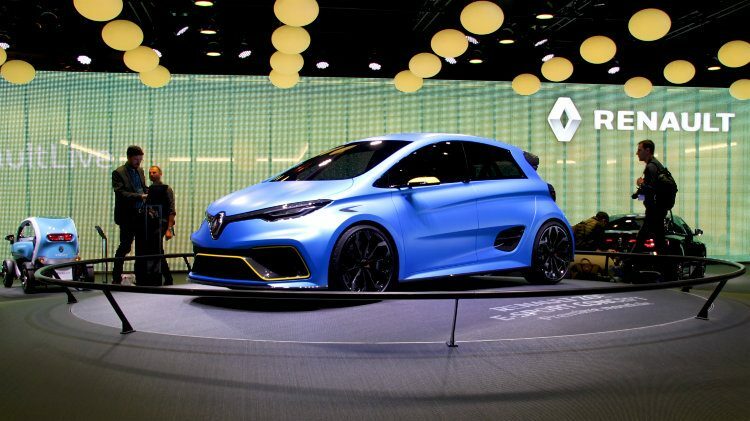 Renault took a 17.2% share of the German new electric car market. Volkswagen is fast catching up in electric car sales in Germany in 2017 and was the second best-selling electric car brand. VW’s 16.4% share of the electric car market in Germany in 2017 was only 2% less than Volkswagen’s share of the total German passenger car market. Smart with a 15% market share was the third largest electric car seller in Germany in 2017. At the opposite end of the market spectrum was fourth placed Tesla. Kia narrowly outsold BMW while Nissan was the only other carmaker selling more than a thousand electric cars in Germany in 2017. The electric car sales of Mercedes Benz, Audi and Porsche remained dismally low in Germany in 2017 despite all the electric car studies shown at motor shows in recent years. All three luxury carmakers performed significantly better with hybrid cars in Germany in 2017. % indicates the percentage share of the model of the specific manufacturer’s electric cars sold in Germany in 2017. The Renault Zoe was Germany’s favorite electric car model with 4,322 cars sold and a 17% share of the German electric car market. The Volkswagen Golf, Germany’s best-selling car model since 1981, was in electric form only the second most-popular model in 2017. Volkswagen has a habit of arriving late with new technologies or vehicle classes but then in full force. However, the Golf only narrowly outsold the third-placed Smart Fortwo. Due to relatively low volumes, a big order from for example a car sharing company can heavily influence sales rank position – more than a third of all electric Fortwo sales were registered in December 2017 alone to relegate the Kia Soul to fourth place only at year end. The BMW i3 was the fifth most-popular electric car model in Germany in 2017. BMW sold nearly twice as many purely electric i3 cars than those with a range extender that is classified as a hybrid by the KBA. The relatively expensive Tesla Model S and Model X were the sixth and seventh most-expensive electric cars in Germany in 2017. The VW Up was the eighth most-popular electric car in Germany. The Hyundai Ioniq was hampered by availability problems and ended 2017 as the ninth best-selling electric car in Germany. The Nissan Leaf rounded out the top-ten list of Germany’s favorite electric cars in 2017. The Leaf seems to have lost its early-to-market advantage.